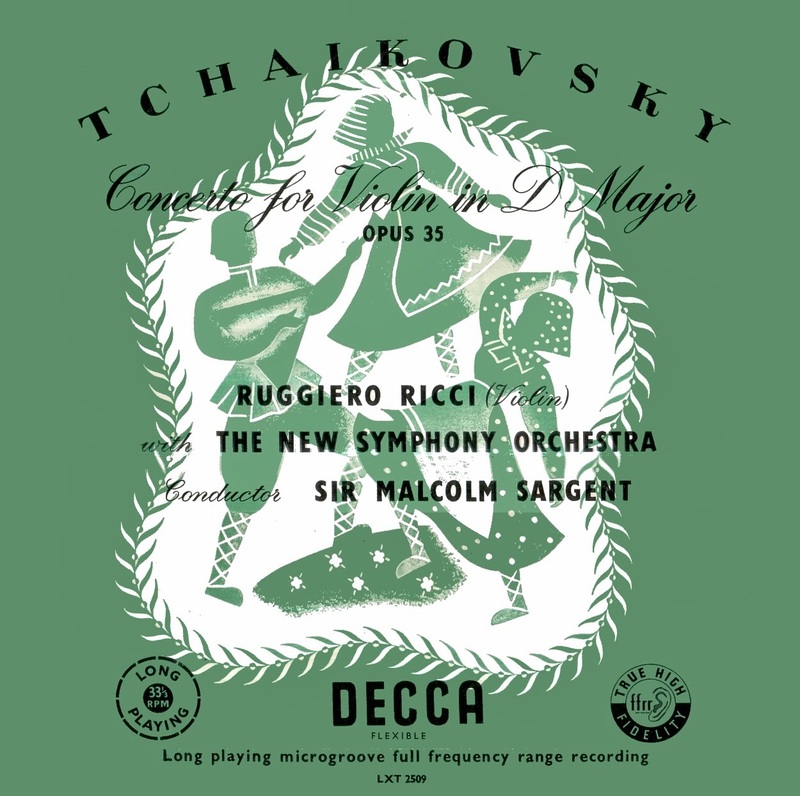 Side One is really superb (the violin harmonics go to <30kHz in the Cadenza) - Side Two is marginally inferior (also in terms of performance) & transferred at a slightly lower level (a subdued pressing 'pimple' is near the start for a couple of revolutions).. There is truly a blissful depth reached here, thank you! The harmonics are stunning as advertised! 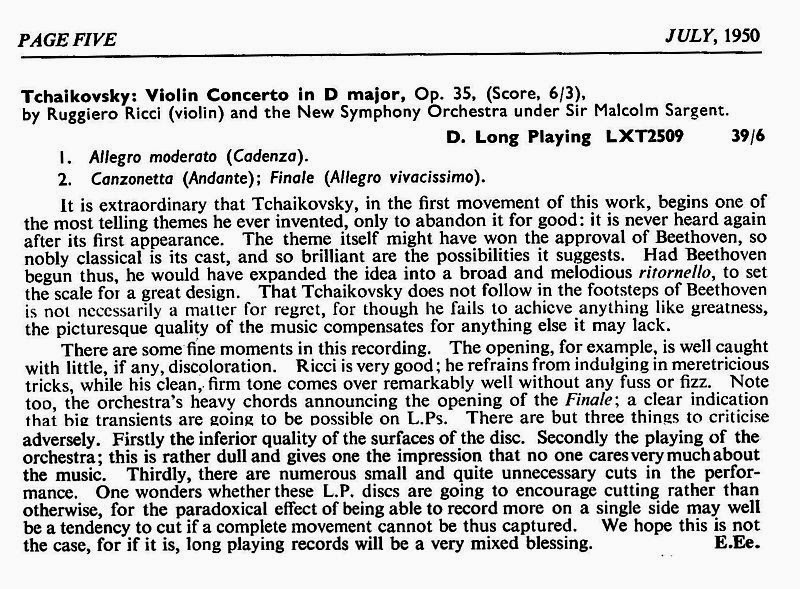 This should have been preceded by Ricci's 1954 Sarasate recital - but I couldn't quite 'get away with' using an unwashed late-pressing as the source - so that will follow 'shortly'. This LP I bought in 1986 - and it was head-and-shoulders above the other elderly LXT's for sound; the recut matrices obviously assisting: but this really is a 'Full Frequency Range Recording' - at least on the 24/96 files..
Well..the microphone placing is 'near-perfect' on side 1 (the orchestra is clearly separated from the violin) - but maybe the tape-stock used for the 2nd sessions wasn't quite as good. Of course, in 1950, they didn't have my 'record-player'! The stereo Campoli version (have a new 1958 'CS' copy) is remarkably good for an early stereo - but I've gone-off his style. There's a late Ricci that's quite rare - 2LP's of Vivaldi sonatas on 'Etcetera'..and Ravel's 'Tzigane' (mono 1960 LXT pressing, c/w Lalo S.Espagnole) is also superb. If I was using CD-RW I would've corrected the slight volume imbalance between sides - but the 24/96 software only goes in 0.5dB steps - and the 'difference' may be less than that...but is visible via Frequency Analysis..
Ahh, suppose recording wasn't all that simple so as to always guarantee top results even a day apart! 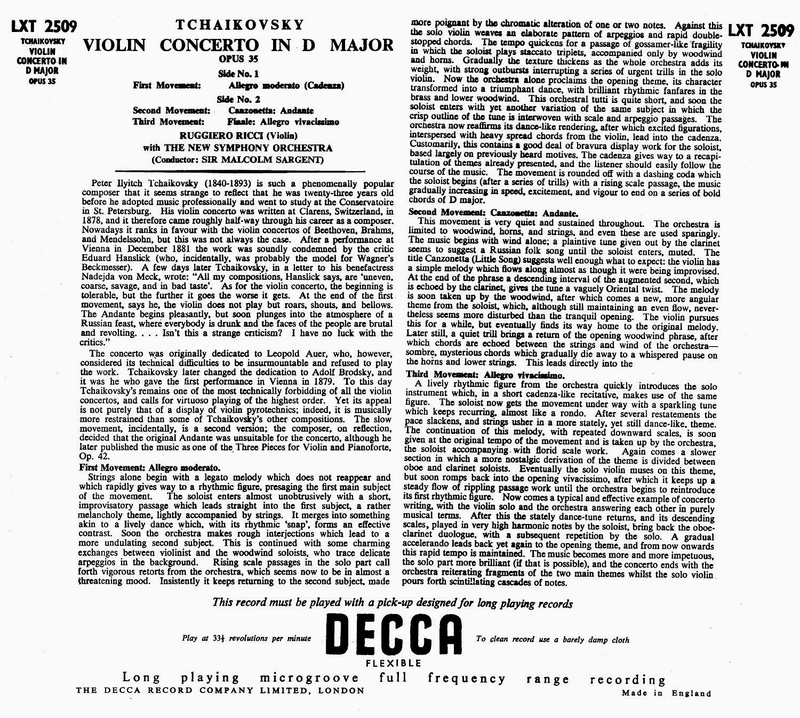 Look forward to the Sarasate (at least..), tho Vivaldi's sonatas from Ricci sound just as interesting as anything else you have, ha-ha! The Sarasate will be nice, too..and hopefully 'Sudso' will have made editing a doddle...also have the stereo recital with Mr Lush..